Looking for some outdoor adventure this holiday season? There is plenty to explore at Strathcona this time of year, don’t let the cold keep you indoors. Many of the sights of summer are unrecognizable in December, with a winter’s dusting of snow. Strathcona is host to numerous trails that are enjoyable for novice to advanced winter explorers. 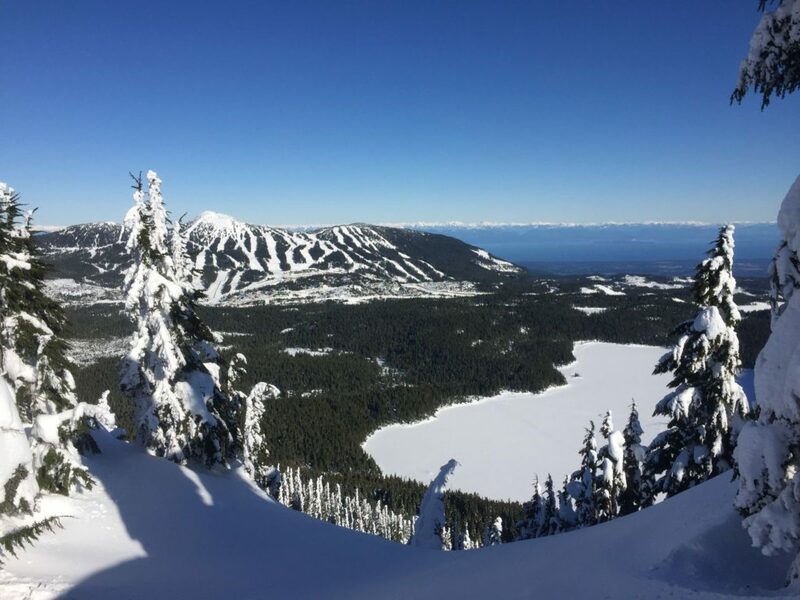 Vancouver Island is known throughout BC for its mild and wet winters, where it is not uncommon to have snowpacks of 8- 10 meters in the alpine! Winter temperatures in this area usually vary between 5 to -10 degrees, with a few sunny days that make for great exploring. We have talked to a few keen winter explorers, who enjoy getting after the endless outdoor possibilities offered on Vancouver Island. They have helped us put together a couple of spots to check out this winter, as well as offered some safety tips for approaching the hazards that are present during the season. 1. Trip Plan. Plan your Trip. Know the terrain and conditions, check the weather and always fill out a Trip Plan and leave it with a responsible person. The reason you should complete a trip plan and leave it with someone you trust is so someone will know where to begin a search if you do not return at the intended time. If you leave a trip plan with a friend, make sure they are aware of why you are doing so, and explain to them the importance of their role. The trip plan must answer all the basic questions (sometimes known as the 5 W’s and H), as all of these questions will be asked by a search manager initiating a search. WHO? Provide names and a detailed description of who is in your party, what they are wearing, gear they have with them, training and experience, medical conditions, who to notify, etc. WHEN? It is important to include when you are going and when you plan to return from your trip. If you are not back at the intended time or day, this is what will initiate a response first from your friend then from Search and Rescue. It is good to build in a buffer to allow for minor mishaps and underestimating the time it may take for your trip. WHY? State the purpose of your trip, and the mode in which you will be traveling (e.g. day hike, overnight, skiing, climbing etc.). WHERE? Give specific locations of the area in which your trip is, as well as your intended route to your destination. It is also good to provide an alternate route. WHAT? The equipment and supplies you have with you will help searchers know what to look for, as well as determine your level of preparedness for the given terrain and weather. HOW? Indicate how you are getting to the starting point and endpoint of your trip. Many searches begin at the subject’s vehicle. 2. Train for the requirements of your activity. Obtain the knowledge and skills you need before heading out. Know and stay within your limits. 3. Take the Essentials. Always carry the essentials, and know how to use them. Add other equipment specific to your chosen activity, season and location. As well, fire can provide an important boost to the morale. The survival benefits of fire are more than just physical. It is important practice with fire-making items, and not to underestimate the skill necessary to start a fire, especially in wet weather. Signalling device – whistle or mirror. A whistle or a signalling mirror can increase your chances of being heard or seen. It takes much less energy to blow a whistle than it does to yell, and the sound carries further. A signalling mirror is the device that is responsible for more Search and Rescue subject sightings by aircraft than any other type of signal. In actual rescues, a signalling mirror has been spotted from a rescue plane over five miles distant. Extra food and water (1 liter/person) Sometimes a trip can last much longer than anticipated, and having extra food and water can make the difference between an extended stay and a survival situation. Outdoor activities require energy, and having extra food can give us the boost we need to get out of an unplanned situation. Water is even more important, and is needed by the body even more than food. Water is a more pressing need than food. A loss of 10% of total body fluid will cause extensive disruption of bodily functions; a loss of 20% usually results in death. Extra clothing (rain, wind, water protection and toque)The importance of bringing extra clothing cannot be underestimated, and yet often people have not brought enough clothing to keep them warm in changing conditions. Even in summer, temperatures can vary dramatically depending on the terrain. People often misjudge the conditions they will encounter because they only look at the weather they see before them. Hypothermia is a serious risk if you do not prepare to survive unexpected deterioration of the weather. Navigation/communication aids. Carry maps and a compass at minimum. A Global Positioning System (GPS) receiver, cellular phone, satellite phone, and hand held radio—all with fully charged batteries—are also valuable tools. Know how to use these items, but don’t over-rely on them. Emergency shelter. Always bring a orange tarp or blanket. These can also be used as signalling devices. A tarp can be very useful in creating a makeshift shelter to keep a person dry. It may be the difference between getting hypothermia or not. Pocket knife. A knife is an important survival tool, and can be used to help in shelter building, firewood collecting and a number of other things. Sun protection (glasses, sunscreen, hat). Sun protection includes glasses, sunscreen, and a hat. Sun exposure can lead to hyperthermia, dehydration, and burns. 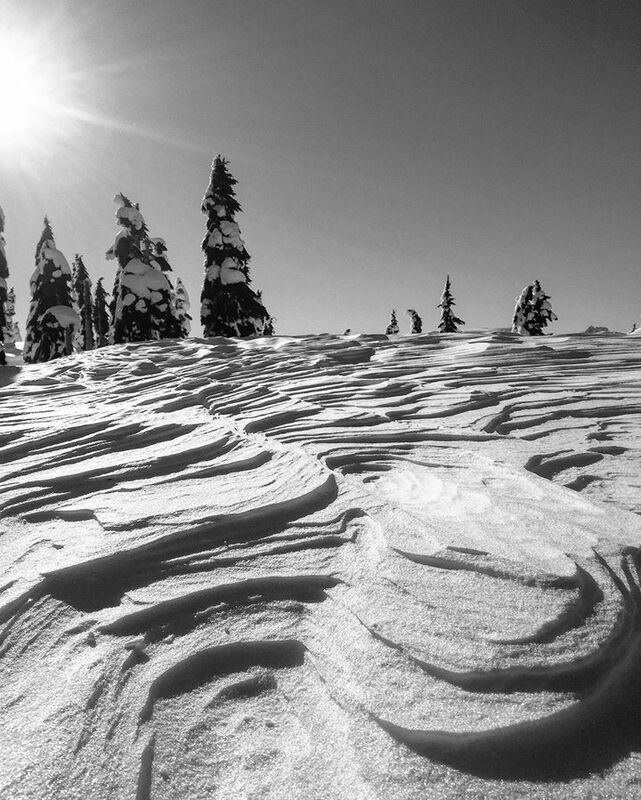 In bright environments like snowfields, it can also lead to snow blindness. These conditions can be painful, dangerous and debilitating. Leave from: Nordic Centre at the base of Mt. Washington. The roads are plowed in winter, but do require snow tires. If planning to stay overnight please follow parking procedures. We asked the Mindful Explorer, Adventure Writer & Blogger Chris Istace for his advice. “I personally love heading up Forbidden Plateau via the old Wood Mountain ski hill to head up to Mt Becher. Many families go to this spot (although most will stay just out of the park boundary and toboggan down the old ski hills).” Stay low to avoid overhead avalanche dangers. If you do want to explore this Southeast corner of the park, and look for some of the leftover relics from the ski hill turn off at at the Piercy Road exit (# 127) from highway 19 and drive roughly 1 km towards Courtenay. Then, turn right onto Forbidden Plateau Rd. Drive back over the highway and proceed roughly 15 km up to the remains of the old Forbidden Plateau ski lodge. Leave from: Crest Mountain Trailhead, on Highway 28 West towards Gold River. After 40 kilometers on this road, you will enter Strathcona Park via the Elk River portal. Continue for 1 kilometer further, then make a right over the bridge at Buttle Narrows. This should take you towards Gold River. Continue on the highway for an additional 27 kilometers, and you will see the Crest Mountain Trailhead on your right. “Snowshoeing is gaining popularity every winter and noticeably on Vancouver Island- but finding the right location can be tricky. The hiking culture that has grown up spending a few hours hiking to Amonnite Falls or the Canyon View Trail is going to find that the options for half-day snowshoeing are very, very limited. If you’re thinking of snowshoeing on any of the trails in Strathcona Park you need to know beforehand that the snowline is at a low enough elevation to make taking snowshoes worthwhile and even then it is a tough grind to get up to the subalpine and back down in a day.” He recommends Crest Mountain trail for snowshoeing or a just a beautiful snow-filled hike when conditions are right. The meandering trail cuts through snow-laden forests, across icy-cold lakes and rivers with intermittent view of the staggering peaks that surround it. If you’re feeling determined, plan for a big day but be sure to only snowshoe as far as you feel comfortable, leaving enough time to get back in the daylight. Stone continues, “Most of the mountain trails on Vancouver Island leave from a low-elevation trailhead alongside one of the main highways. 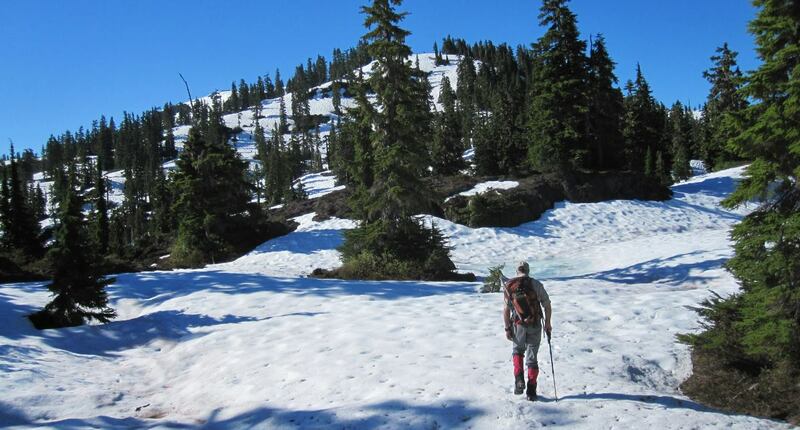 Some years the snow may accumulate all the way down to the highways but in other years it may take a couple of hours of hiking uphill to reach the snow. 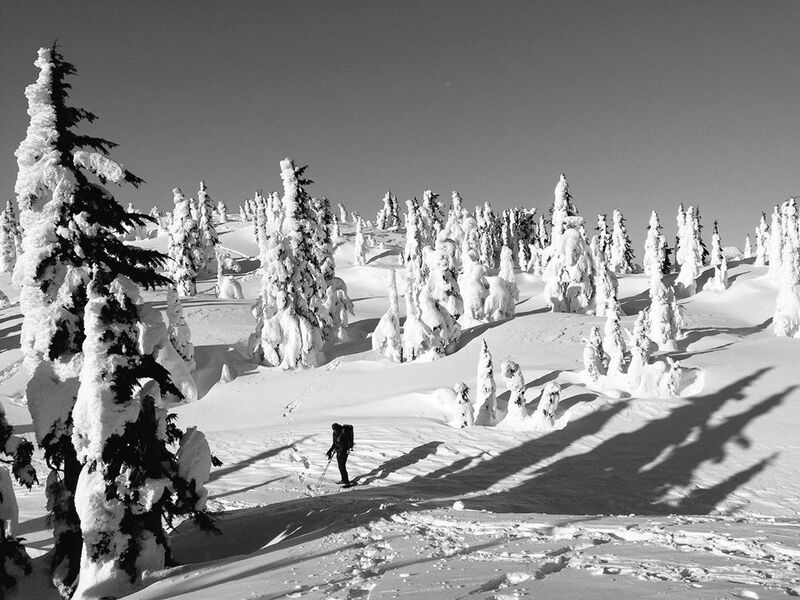 With short winter days it can be a challenge to find the right destination but when everything aligns snowshoeing is a perfect activity to experience the great outdoors on Vancouver Island from December through to May! We hope everyone has a safe & jovial holiday season! Happy New Year from your Strathcona Park Operators 🙂 If you have any questions feel free to reach out to us on our Facebook Page and share photos of your winter experiences in the park!